Improved Initiative: Natural 20 Soaps Strikes A Blow Against Gamer Funk! Natural 20 Soaps Strikes A Blow Against Gamer Funk! Stereotypes follow gamers around like bad smells, and the worst is actually the belief that those who carry bags of funny-shaped dice are not on speaking terms with hygiene. This is usually a blatant falsehood, but it happens often enough that the urban legend is hard to scrub off. That's where Natural 20 Soaps comes in. This is my soap. I'm seriously more excited by this than I should be. I've talked about Natural 20 Soaps before in this post right here, but for those who didn't see it they're a pretty straightforward operation. The idea that was put together by Emily Hawk and her business partner Douglas Menke was to set a trap for geeks (particularly gamers) who would show up to game with a weekend worth of funk hanging around their necks. 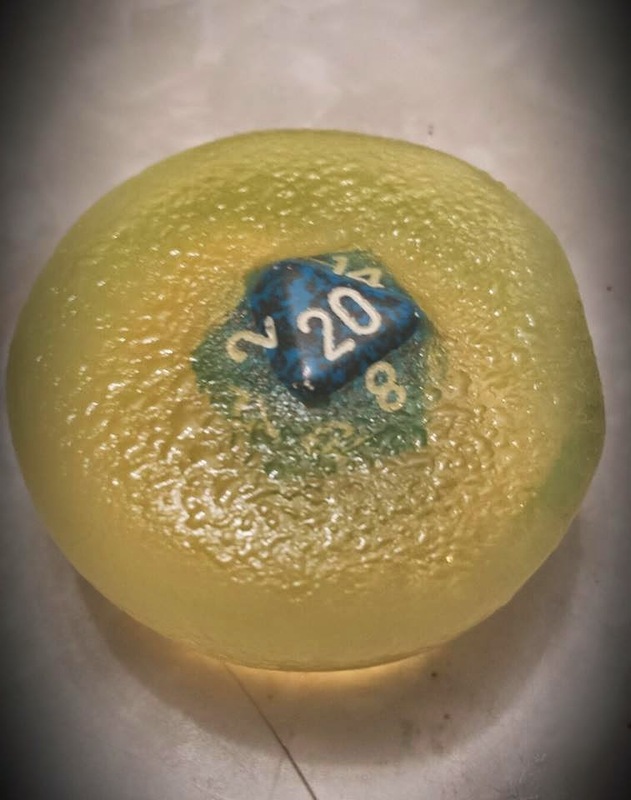 They created soap swords and shields, d20 shaped soaps, and as evidenced by my own picture, trick soaps that you have to wash with in order to get the die inside them. They brought their bars to Chicago-land cons, and made one hell of a splash. Well for those who take their hygiene just as seriously as their character builds, Natural 20 Soaps is expanding both how available it is, and what kinds of great, geeky goods it offers. Da Source, a local gaming company in the Chicagoland area is now going to be distributing their products. 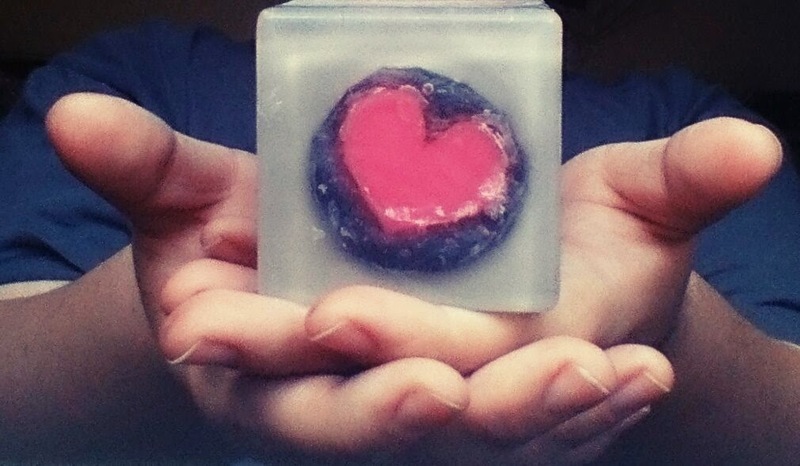 This means that you don't have to go to their Etsy store (located right here) or find them at conventions like CapriCon or C2E2 in order to buy these great soaps for yourself and all your hygiene-challenged, game-loving friends. You can still do it that way, but you don't have to. Stay away from the dark side... it smells funny. In addition to being more widely available than ever before though, Natural 20 Soaps is offering a slew of products, starting with the "newbie set" which is a complete set of d20 dice (20, 12, two 10s, 8, 6, 4) each in its own soap. There's also police boxes for the Whovians, refined companion cubes (the above is an original), miniature Serenity spaceships, and even custom-made action figure soaps. They're also experimenting with pokeball soaps and Hero Clix soaps, which might be a "see what the surprise inside is" purchases. In addition to the cool new shapes and colors though, Natural 20 Soaps still offers all natural soaps that keep the skin moisturized, clean deeply, and don't cause reactions in the same way many store-bought detergents do. They've got more than 50 fragrances on hand, with over 100 more they can offer for those with picky noses, and they offer coconut milk, glycerin, goat's milk, olive oil, honey, and a vegan base for their soaps. If that wasn't enough they're also offering a custom print image that can be put into a bar of soap to make a one-time, one-of-a-kind gift. Also, no matter which kind of soap you get it works great as a shaving soap (which is one of the most important factors for a clean shave according to this list of shaving life hacks). So if you're looking for a great gamer gift with the holidays coming up (Halloween is a holiday, shut up), then check out Natural 20 and see if they've got something for those special dice slingers on your list. If you'd like to support Improved Initiative stop by my Patreon page and become a patron today! If you want to keep up to the minute with all my updates then plug your email address into the box on the right hand side, or follow me on Facebook and Tumblr. Yes. Halloween is a holiday.... and YAY Soap!